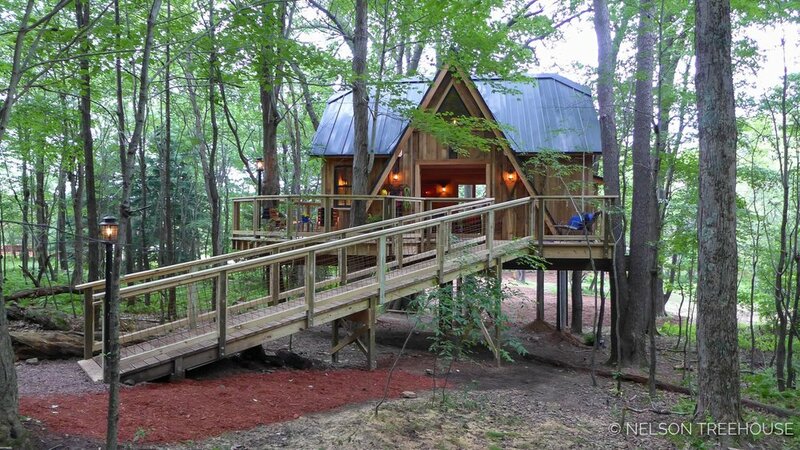 It was an honor to build this treehouse at Outdoor Odyssey in Pennsylvania for the Semper Fi Fund Kids Camp, which provides week-long camping experiences and ongoing mentorship for at-risk children of service members. 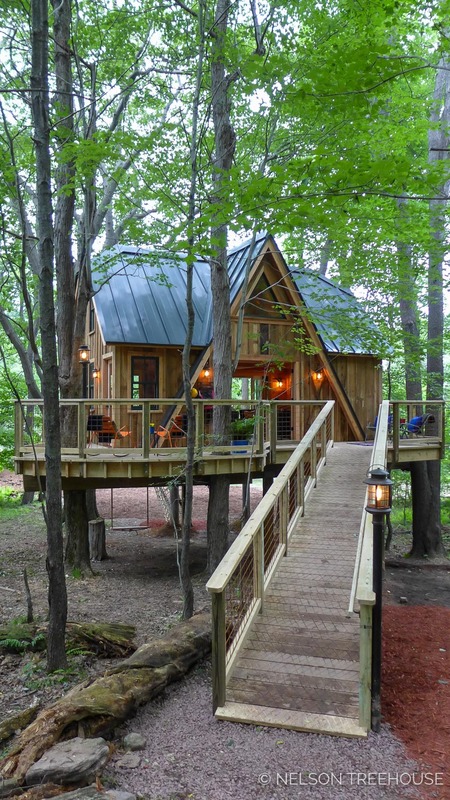 The treehouse serves as a gathering space for groups, and also offers private corners for one-on-one conversations. One day during the build, US Marine Corps Junior ROTC members helped carry massive beams over soggy ground to the treehouse. This was an invaluable boon, as the mud prevented us from driving heavy lifting equipment to site. Big thank you to all those Junior ROTC members for their time and help! 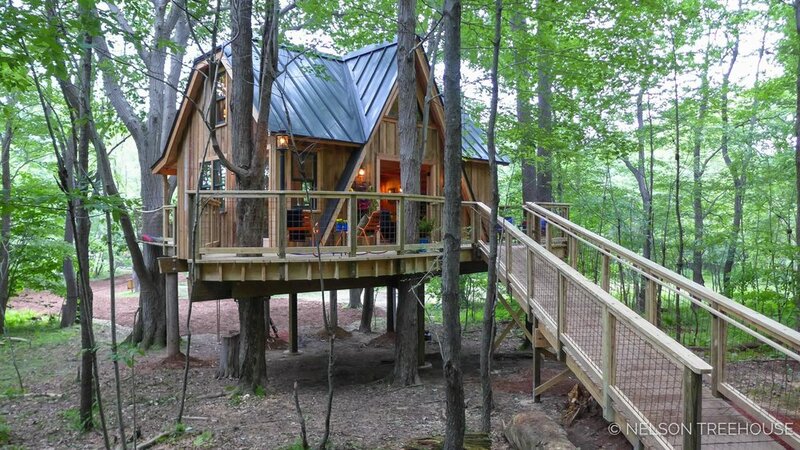 Main access to the treehouse is provided by a gently sloping ramp. 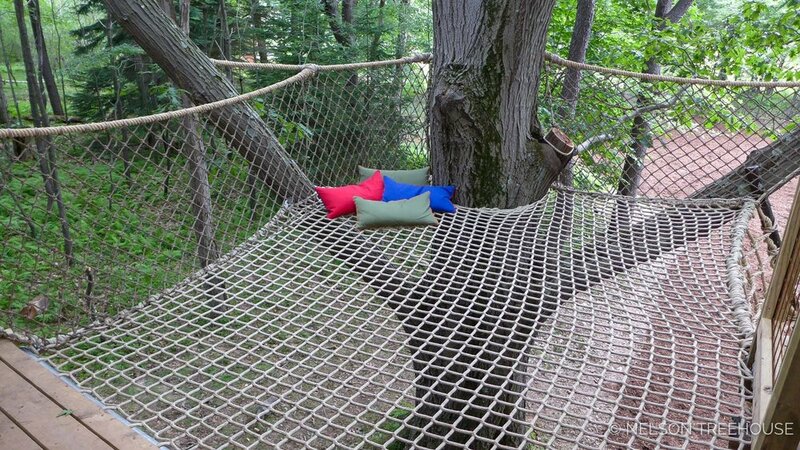 On the other side of the treehouse, campers can scale a net to the deck. Chuck and project manager Scott Atkins integrated reclaimed telephone poles into the design. These poles provide key structural support and pair aesthetically with similar poles on other structures at the camp. 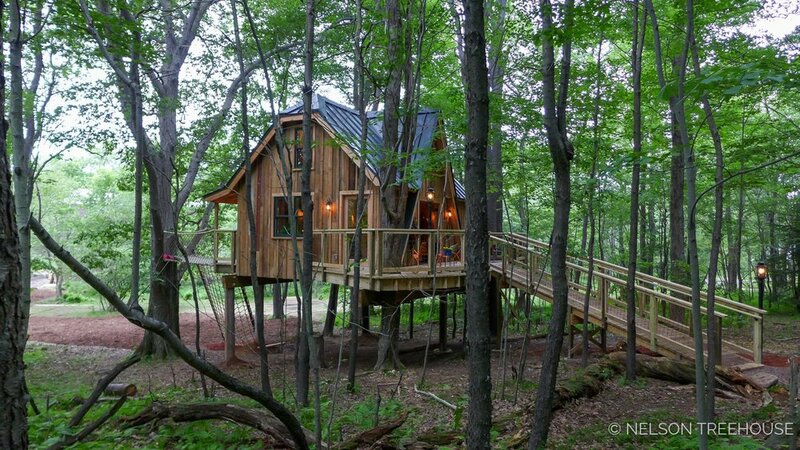 The approximately 500-square-foot treehouse roosts in a grove of oak trees. The front deck holds a private seating area between two of the host oaks. The exterior siding is made of reclaimed pine from an old barn. The first floor holds a gathering space for groups. 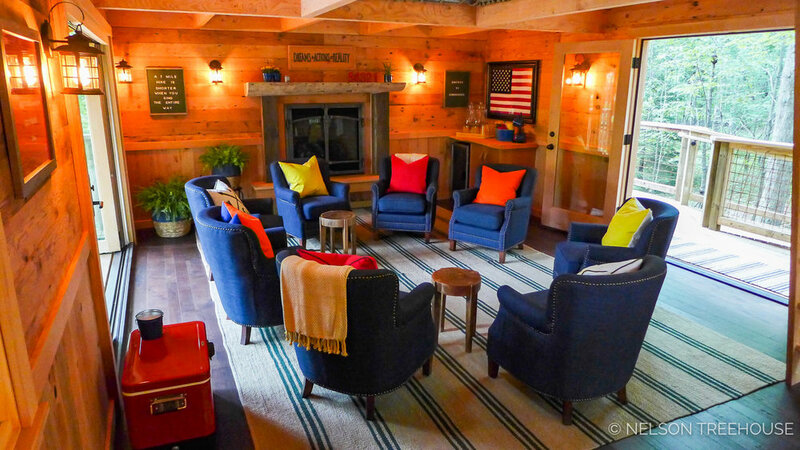 Comfy chairs, a snack bar, and gas-powered fireplace make the room ultra-cozy. Large doors open to the back deck. A net stretches out from the side of the deck, creating a playful hangout zone. Back inside, a ship’s ladder leads up to the loft. 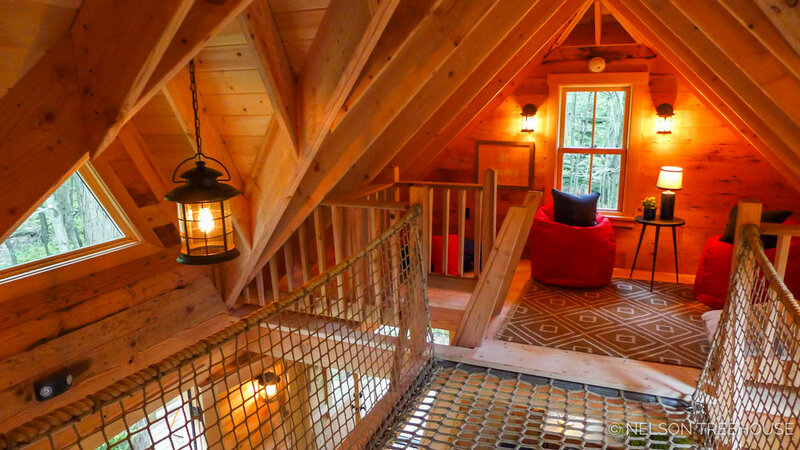 The loft is made up of two parts, each at opposite ends of the treehouse. A netted catwalk connects the two sides. The loft is intended to provide private space for conversations between mentors and campers. We’d like to thank the Semper Fi Fund Kids Camp for a deeply meaningful build. We wish the campers joy and rejuvenation up in the trees. 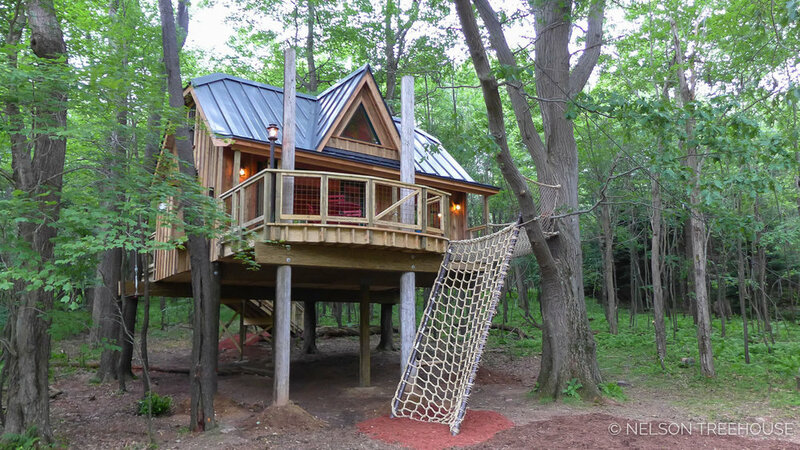 We hope you’ve enjoyed taking a look inside our Semper Fi treehouse! 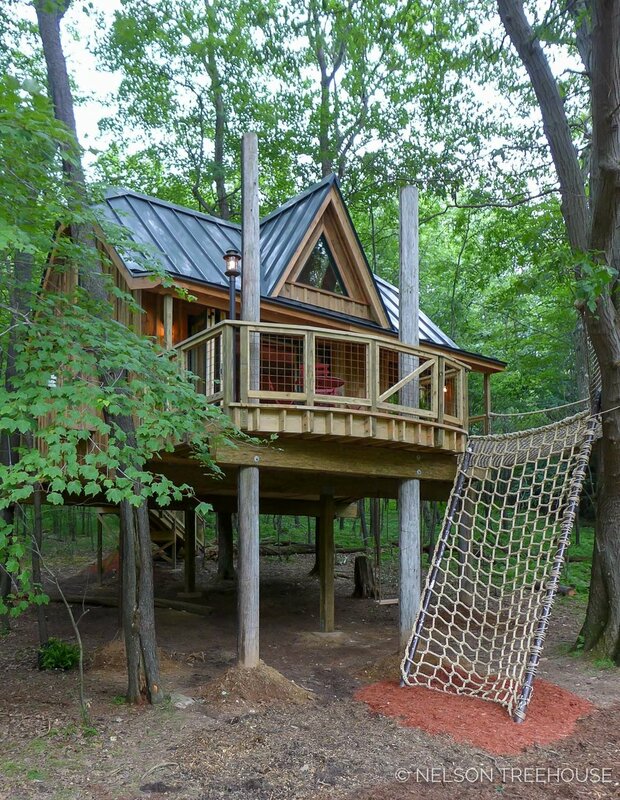 Let us know your favorite part of this treehouse in the comments below. 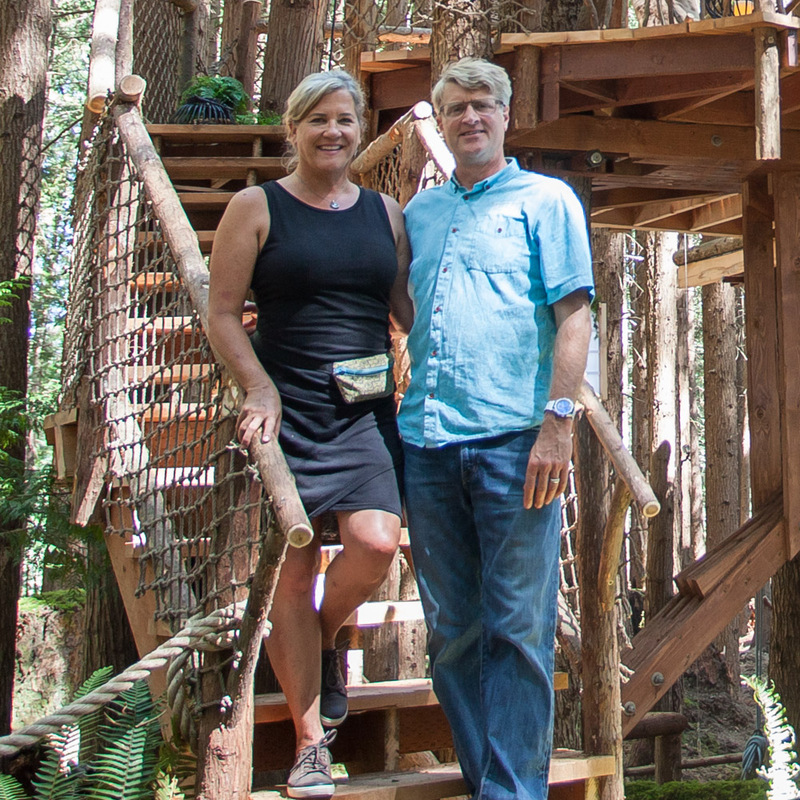 And take a look at all our photo tours from Season 11 of Treehouse Masters.